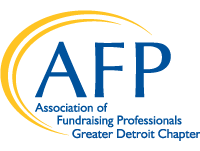 Welcome to the web site of the Greater Detroit Chapter of the Association of Fundraising Professionals (AFP), a membership resource utilized by fundraising and nonprofit professionals throughout southeastern Michigan. AFP is the only association representing the entire fundraising profession. It exists to foster the development and growth of fundraising professionals, to preserve and enhance philanthropy and volunteerism, and to promote the highest ethical standards in the fundraising profession worldwide. Greater Detroit AFP has more than 300 members from seven counties in southeast Michigan. The Greater Detroit Chapter of AFP offers the best networking opportunities, an unwavering commitment to the highest ethical standards, and the most exciting and cutting edge educational and professional advancement opportunities. Day, National Philanthropy Day, dynamic professional advancement seminars, and other great networking opportunities.